The Gables Club Tower II is the second of two eighteen story buildings located on Edgewater Drive, a roadway that is in fact near the water's edge. The position of the building near the water is opportune yet the building is just south of Douglas Road, a roadway that allows residents to visit other places throughout “City Beautiful” within a shorter amount of time. 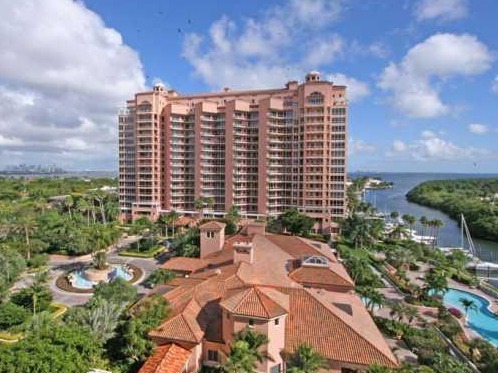 Gables Club Tower II features a 13,000+ square foot club that is available exclusively to residents and also includes its own gourmet restaurant, part of the many amenities which also include boat slips, tennis courts and a jogging path. You'll find a total of 99 Coral Gables condos for sale available with a maximum of 10,190 square feet and features such as granite kitchen countertops, stainless steel appliances and terraces that look out onto the water and/or the Coral Gables cityscape. Take a leisurely stroll along the water's edge or immerse yourself in the many sights of Coral Gables like Miracle Mile, the Village of Merrick Park, the lush Fairchild Tropical Gardens and the rich history of the Biltmore Hotel. The Gables Club Tower is barely five minutes away from Coconut Grove home to CocoWalk where you'll find great shopping and dining. The University of Miami is found to the northwest of Gables Club Tower condo.